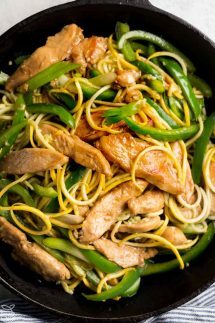 A healthy delicious Low Carb Lo Mein recipe with zucchini, green onions, chicken plus a fabulously tasty stir fry sauce! 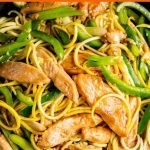 You can make my easy zoodle lo mein recipe in next to no time, the zucchini noodles make an excellent alternative to regular noodles and they cook in a flash! Start by slicing the chicken into thin strips and then marinating it in the dry sherry, coconut aminos (or low sodium gluten free soy sauce), garlic, and ginger for about half an hour or so. Then, thinly slice the bell peppers and green onions and using a julienne peeler, or a spiralizer, make ‘zoodles’ from the yellow squash. I find it easiest to simply microwave the zucchini noodles for up to a minute until they are just cooked and no more, then pat them with a paper towel to remove excess water and set aside. Drain the chicken from the marinade and reserve the liquid, then heat one tablespoon of oil in a large nonstick skillet at a medium-high heat and cook chicken pieces for about four minutes per side until the chicken is fully cooked and set aside. Next, cook the green bell pepper for a couple minutes with a little more oil as needed. Add back the marinade and cook it for a further 1-2 minutes, adding back the chicken, zucchini noodles, green onions and finally the sesame oil and give it a good stir and warm through. It’s best served right away while it’s still hot, and if you like a little heat it tastes great with a sprinkle of red pepper flakes. 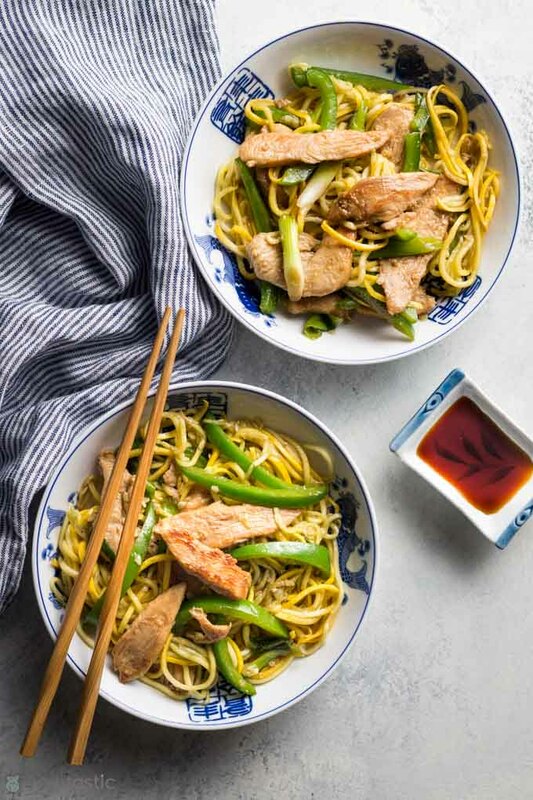 A quick and easy healthy takeout recipe you can make at home, this Low Carb Lo Mein recipe is keto friendly. Cut the chicken breast into thin strips. Marinate the chicken in dry sherry, coconut aminos, garlic, and ginger for 30 minutes. 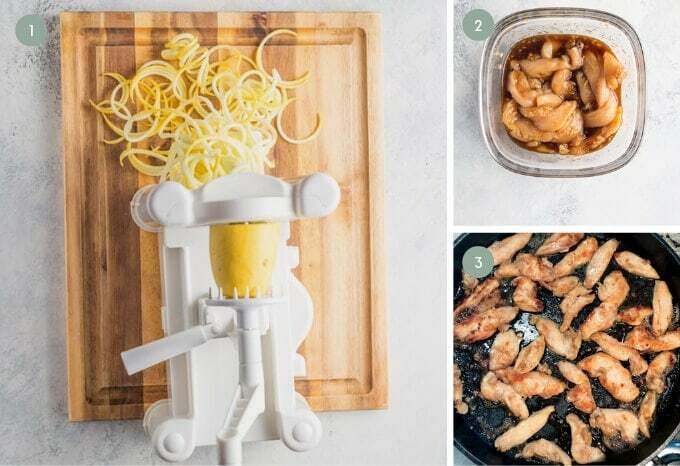 Using a julienne peeler or spiralizer, prepare the yellow squash into noodles. Microwave the zucchini noodles in a covered dish for up to one minute until they are just barely cooked. Then place on a paper towel and pat dry to remove excess liquid. 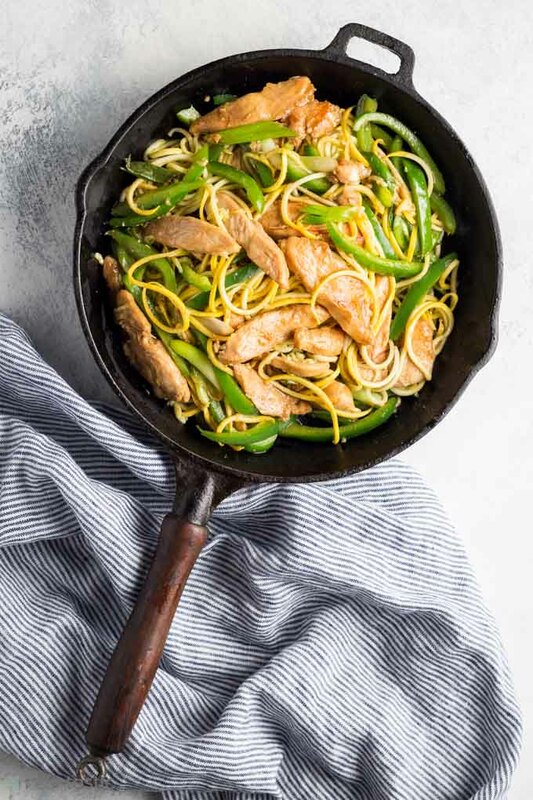 Heat 1 tbsp coconut oil in a large nonstick skillet or wok over medium-high heat until hot, then drain the chicken from the marinade (reserve marinade) and add to the pan and let it cook for about 4 minutes per side, then remove from the pan. Add 1 tbsp of coconut oil, then the green bell pepper slices, and cook them for 1-2 minutes, stirring frequently. Pour in the remaining marinade and cook it for a further 1-2 minutes over a medium heat then add back the chicken, zucchini noodles, green onions and finally the sesame oil and stir it all really well to mix the flavors. Serve immediately while hot from the skillet, and sprinkle with red pepper flakes if desired. 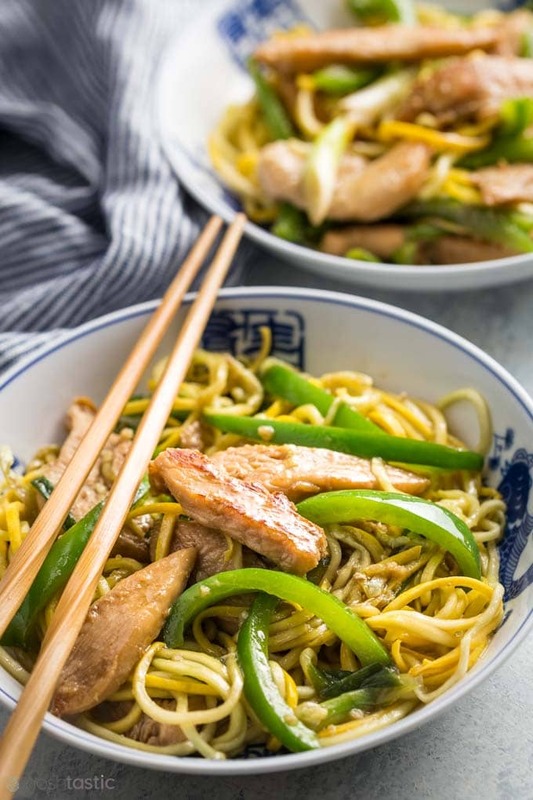 Storage - While you can reheat this recipe, I think it's best served right away as the 'zoodles' tend to get soggy when they are left sitting for a while. However, if you don't mind that it will keep for three or four days in the fridge. 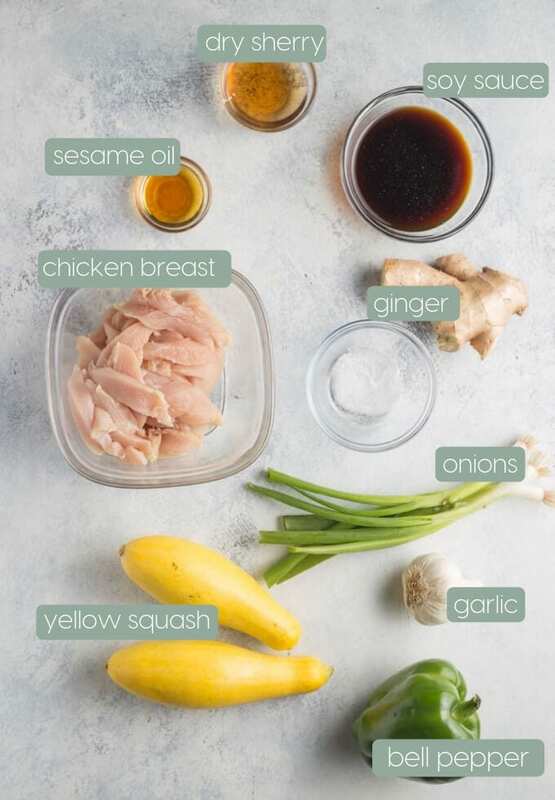 Substitutions - you can sub the yellow squash for a green zucchini instead, and if you don't use alcohol you can omit the sherry but it may negatively affect the flavor of the recipe. Carb Count - soy sauce usually has less carbs than coconut aminos, and the carbs can vary quite a bit between coconut amino brands. I prefer to use coconut aminos as it's milder and naturally sweeter even though it adds a few more carbs.